When attempting to explain theoretical extra dimensions necessary in mathematics to describe observable physical events Einstein once said "I see a clock, but I cannot envision the clockmaker". The ancients saw the cosmos in the same way. They could explain the motion of the Moon and the position of some of the planets using simple geometry. Although we are not sure if the ancients did have telescopes they did have lens less sighting tubes. 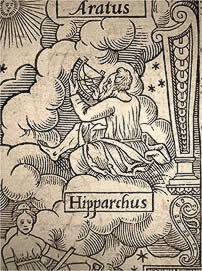 In the 6 BCE the Greek philosopher Iamblichus wrote that "Sight is made precise by the compass, rule and telescope". 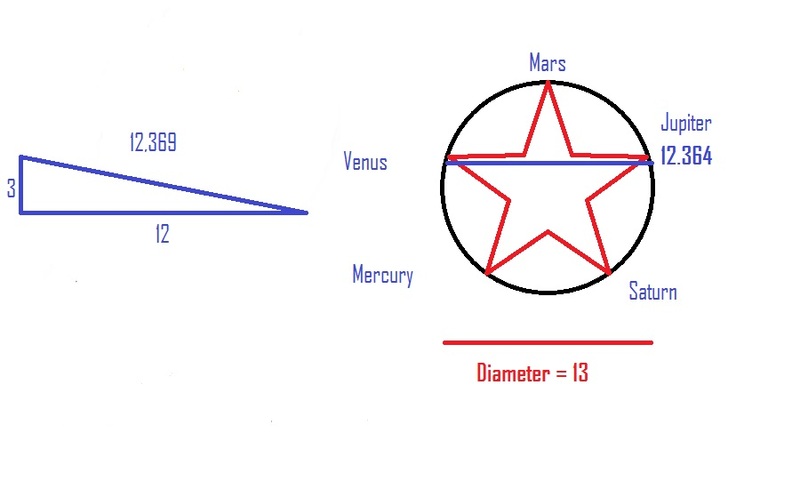 The Greek astronomers attached a sighting tube to a protractor so that they could precisely measure the positions of the stars and planets. The device was called a Dioptra and was used by Euclid, Geminus and Hipparchus to make accurate measurements of the night sky. We have a good idea of what Hipparchus looked like as he is pictured on five Roman coins issued between 138 CE and 253 CE. 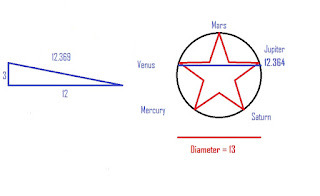 Once the positions of the planets and the moon had been measured with good accuracy it seemed logical to establish the relationship between them. The ancient and medieval scholars reasoned that the objects they could see in the night sky had been created for specific reasons and gaining an understanding of this would bring them nearer to the divine creator. Like Einstein they could see the clock but not the clockmaker. There are many symmetries in the night sky, for example Sirius (the Dog Star) and the Pleiades subtend an angle of 60 degrees to an observer on Earth. I would like to present another couple of examples here. Everyone knows that there are between 12 and 13 full moons per year. 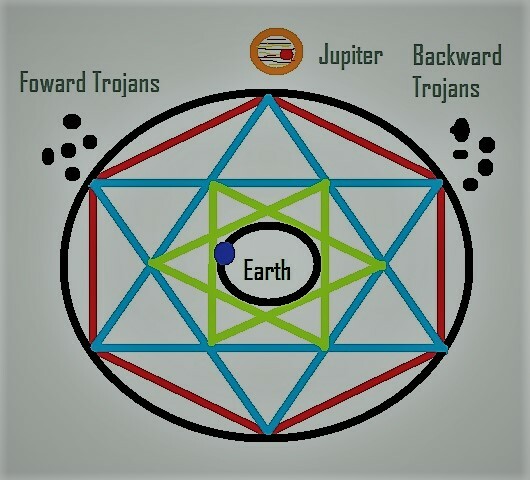 The ancients worked out that if you drew circle with a diameter of 13 units and wrote the names of the five wandering planets equally around the circumference and then drew a pentagram inside the circle with the star points aligned with the names of the planets the chord diameter would be 12.364 which is a 99.95% accurate estimate of the number of full moons in a year. An even more accurate result can be obtained by drawing a right angled triangle with base 12 units and height 3 units. The hypotenuse length can be calculated by Pythagoras's Theorem and is exactly 12.369 which is accurate to 99.999%. Jupiter is the caretaker of the Solar System and its gravity has been helping to collect space debris over many millions of years. In Jupiter's orbit, at 60 degrees behind and 60 degrees in front of Jupiter there are two Trojan Points where some of this debris has collected. 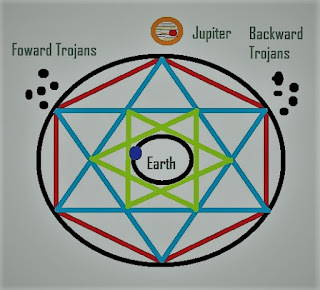 If we draw Jupiter's orbit and mark the Trojan points and then use them to construct a six pointed star (the Star of David) and then draw another six pointed star inside the first one then a circle drawn in the centre space matches the orbit of Earth. There are may other examples of symmetry in the night sky. Kepler in 1596 in his book Mysterium Cosmographium described a model of the Solar System with each planet attached to a concentric regular polyhedron, from the inside out he proposed: octahedron, icosahedron, dodecahedron, tetrahedron, and cube. Unfortunately Kepler did not realise that the Earth was not the centre of the Solar System and also that the planet's orbits were elliptical and not circular. This brings us to Bode and his famous law (discovered in 1766 CE by Titus but popularised in 1772 CE by Bode). Bode's Law (sometimes called the Titus-Bode Law) states that, extending outward, each planet is be approximately twice as far from the Sun as the one before. Bode took a series of numbers 0, 3, 6,12, 24, 48, 96, 192 and 384. He added 4 to each one giving 4, 7, 10, 16, 28, 52, 100, 196 and 388. These numbers fit the planetary radii well except for Neptune. The missing planet at radii 28 was attributed to the asteroid belt after Piazzi discovered Ceres in 1801. So from the times of the ancients until the modern era astronomers and astrologers have been searching for symmetry in the heavens. Shakespeare's works reflect this and Shakespeare uses celestial harmony to reflect harmony on Earth and celestial chaos to reflect chaos in Earth. When in Hamlet Act 1, Scene 1 it is announced there is a new star in the heavens upsetting the celestial order it would have been clear to the audience that there was something upsetting the order here on Earth and that something was rotten in the state of Denmark. Shakespeare often refers to fortunate alignments of the stars so his audiences would immediately understand that a character in a play would have a favourable outcome but if the stars or planets where aligned against them it would end badly. For example in King Lear Act 1, Scene 2 Edmund forges a letter to try to dispose of his half brother Edgar and then being a total scoundrel tries to half heartedly defend his brother in front of the King so as to hide the fact he forged the letter "These late eclipses in the Sun and Moon portend no good to us". The Royal Shakespeare Company used a huge copper disk to represent the Sun as a backdrop behind Lear's throne in their recent (2016/7 Season) production of King Lear. The play featured Sir Antony Sher as Lear. During the play characters appeared on stage with circular banners on poles which covered over the Sun as though it was eclipsed. The play is being brought back onto the stage again by the RSC in 2018 with the same set and most of the cast of actors. In Romeo and Juliet, in the prologue to the play, we are introduced to "a pair of star crossed lovers" which also does not end well. However, in Taming of the Shrew Act 4, Scene 5 Shakespeare writes "Happy is the man whom favourable stars...". Shakespeare never tried to lose his audiences by going over their heads with scientific reason and convoluted logic. He used simple terms that everyone could understand straightaway. This was his genius and helps explain in part why his works have endured over the centuries.